Join us as the Lions take on the Edmonton Eskimos this Friday, October 19th at 7:00PM! The fun kicks off with their famous "Tailgate Party" starting at 5:00PM. 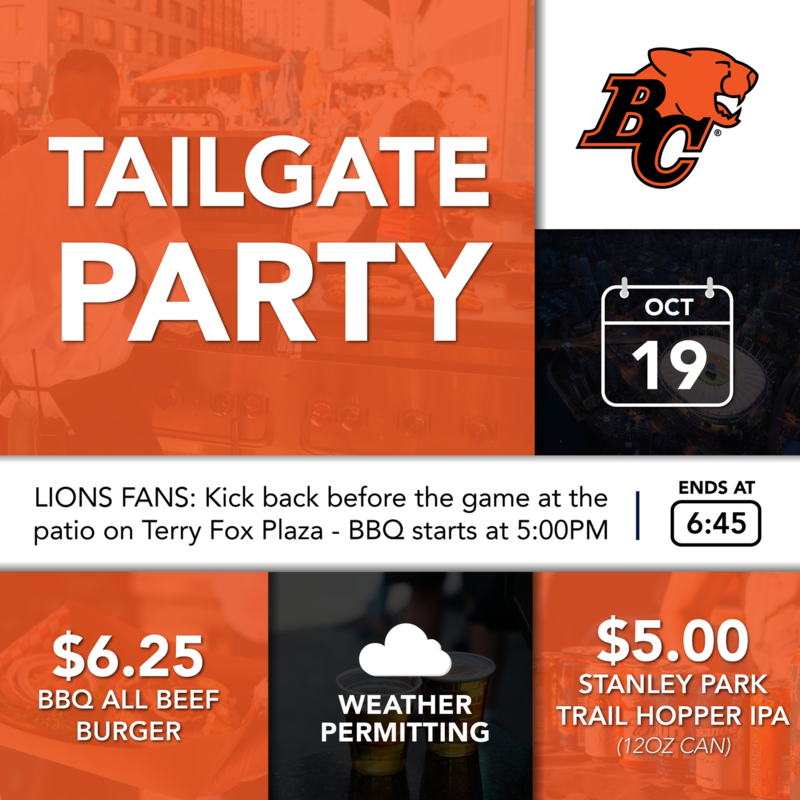 The best tailgate party in Vancouver kicks off at 5:00PM on Terry Fox Plaza (weather permitting) where we will be serving $6.25 house-made all beef burgers and Stanley Park Trail Hopper IPA 12oz cans for just $5.00. 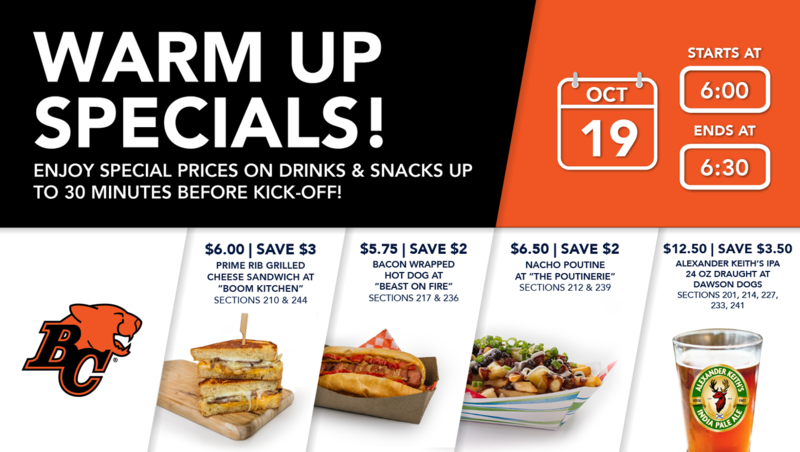 After the Tailgate Party, head inside BC Place for some delicious food and drink specials – served until 6:30PM. $3 OFF PRIME RIB GRILLED CHEESE SANDWICH! Prime Rib, smoke cheddar, aged cheddar, provolone, French loaf . $2 OFF BACON WRAPPED HOT DOG! Double smoked bacon, all beef hot dog, caramelized onion and pepper, served on a pretzel bun. Poutine with black beans, salsa fresca, cheese curds and sour cream. $3.50 OFF ALEXANDER KEITH'S IPA 24oz DRAUGHT BEER! $2.75 OFF 1oz RUM HI BALLS! $2 OFF CHEESY GARLIC POUTINE! Our signature garlic fries, Quebec cheese curds, mozzarella, cheddar cheese and house made 3 cheese sauce. Click here for more game day and spectator information.